On Tuesday students celebrated their hard work over the summer staying screen-free as part of Ms. Smith’s No Tech Tuesday Challenge. 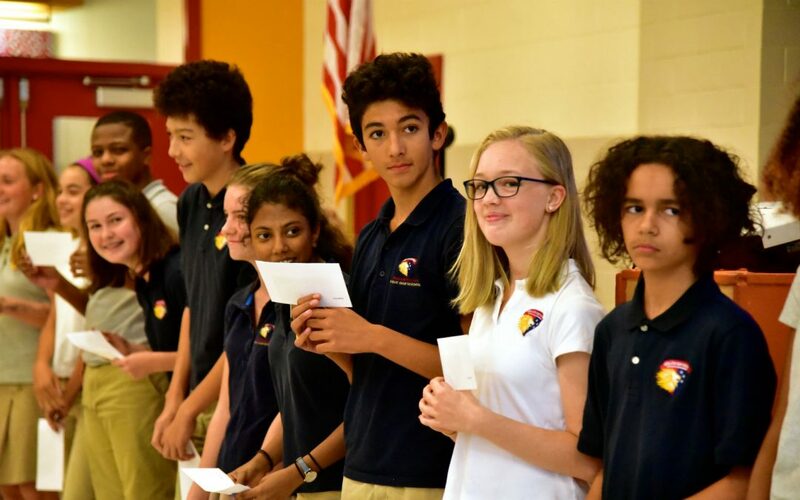 In a middle and upper school assembly, 38 eighth and ninth graders were commended and rewarded for living tech-free on 11 Tuesdays. The students watched a video of several interviews with students who participated, and Ms. Smith highlighted the ways students can spend time off their screens, including time in nature, time with family, and time reading. She also highlighted some of the dangers of technology overuse including poor sleep and bullying via social media. Student participants in the challenge included eighth graders Dainius Antoine, Allison Bleimehl, Luca Camponovo, Eliza Cattaneo, Vivian Claire, Lana Coulon, Elliot D’Alessandro, Cian Fitzgerald, Alex Kirk, Brendan Kirk, Kofi McFadgion, Estelle Monti, Ava Pugh, Ezinne Ukaegbu, Caroline Watterson, and Janika Webb. In ninth grade, Fiona Campbell, Nikolas Davis, Zoe Edelman, Helena Ikenberry, Oliver Krisetya, Ketan Mampara, Lydia Moore, Sucha Mulholland, Ella Norlen, Sebastian Oosterveld, Joshua Perrin, Max Regardie, Lucas Roemer, Alexander Roodman, Griffin Smith, Amaya Tatum, Daniel Voss and Una Yarsky triumphed over the tech-free challenge. Four additional students – Rebekka Stewart, Adriana Torero, Juliette Warga, and Vladimir Zadorojny – succeeded in the challenge but chose not to receive the $100 prize. Instead, Ms. Smith donated the money to the school in their names. Later that night about 100 parents and students assembled in the MPR for the PA meeting to watch the documentary, “Screenagers.” Released last year, this film explores the risks young people face of failing in school, suffering social isolation and becoming digitally addicted, due to excessive use of smart phones, gaming systems and other tech devices. Read more on the Challenge, including a great video from the Assembly produced by Neil Berment, as well as parent resources on our No Tech Tuesday page.